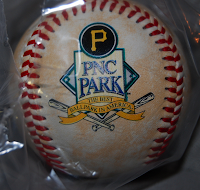 One of the two baseballs I got at PNC Park has the PNC Park The Best Ballpark in America logo on it. There is nothing else on it, but it does have an interesting white with dirt looking background design. PNC Park is big on them being the Best Ballpark in America. I have no idea if they were somehow actually voted that or just kind of decided it themselves, but personally we still love Wrigley the best and Progressive Field in Cleveland is about tied for second with PNC Park, Nationals Park (my opinion only), and Chase Field (Mik’s opinion only). Come to think of it is not part of a park being the best have to do with enjoying watching the home team? Anyways part of what makes it not seem the best is how much they try to promote they are the best with the logo that is on my baseball being all over the park. I think it goes way too far when I found the logo was not just on the soap dispensers in the restrooms, but also on the toilet paper dispensers (see photo below).